So at the beginning of the year, I signed up for another KAL - this time for Cookie A. 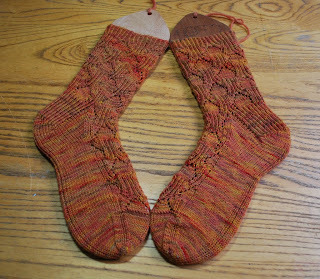 's bookknit.sock.love - so popular it's sold out and is being reprinted at the moment... 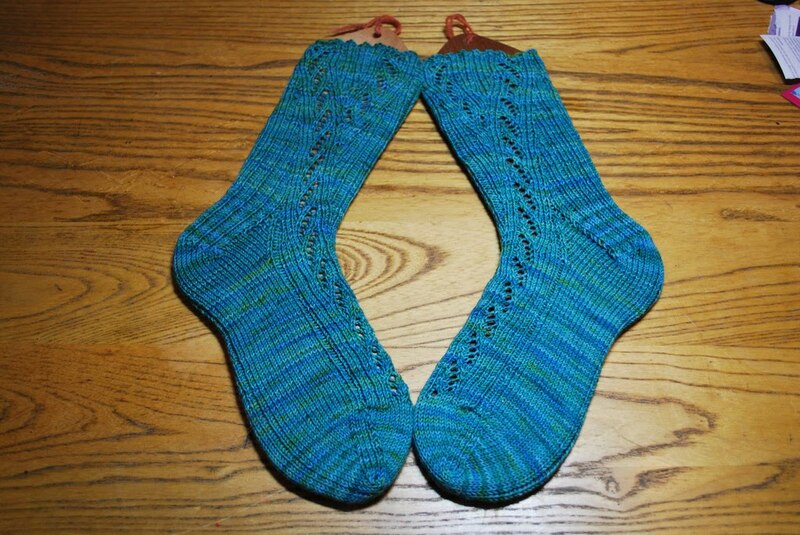 There are 19 pairs of these socks, and we're knitting them over 20 months. The Ravelry group attached to this KALis an extremely nice place to be - it's a group of generally pretty knowledgeable and skilled knitters sharing information, techniques, and bits and bobs about their lives; it's friendly, it doesn't seem to go round in the endless circles a lot of groups do when people don't read the rest of the thread; and the moderators are excellent. And I now have nine-going-on-10 pairs of extremely nice socks. 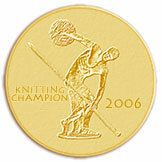 I'll share the first 5 here, and the second 5 this time next week - I have a reason for this! All these are knitted top down, and the book is divided into Columns, Tesselations andDiagonals, which express pretty accurately what each category of pattern is doing. First up, Hedera. This is one I'd sort of been avoiding because a friend had submitted a pattern for the very issue of Knitty this first appeared in, using one repeat of the pattern up the back, and a very interesting construction; it didn't appear in Knitty, but did achieve paid publication in a calendar; but I'd never had the heart to knit these. 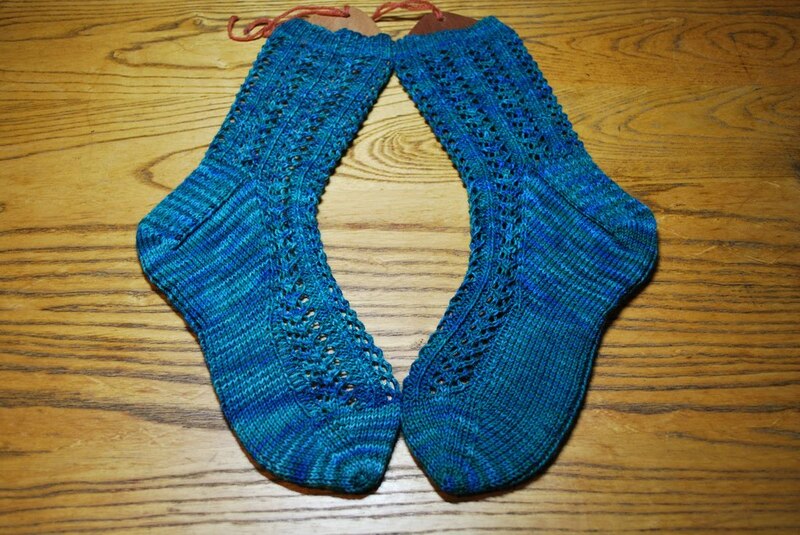 When I did, though, they're lovely - very stretchy and comfortable, in yarn in a colour called Legolas which Jan had dyed me for Christmas. The second pair, somewhat more variegated. 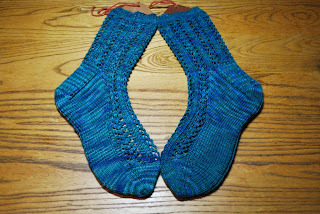 Again, a pattern republished from a Knitty issue, but this time resized for several widths of foot. 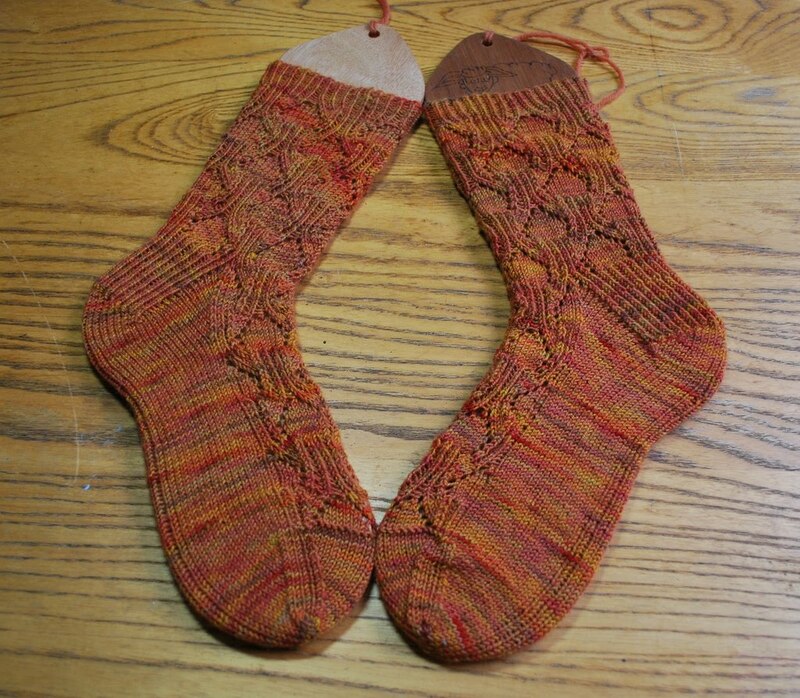 What made these fun to knit (as I'd already made one pair when the pattern came out) was the yarn; Lorna's Laces Shepherd's Sock in Franklin's Panopticon colourway, and a gift from the man himself a couple of years ago. I loved the way these striped so much that I really didn't want to go for the flap-and-gusset heel - so this was my first attempt at an afterthought heel. 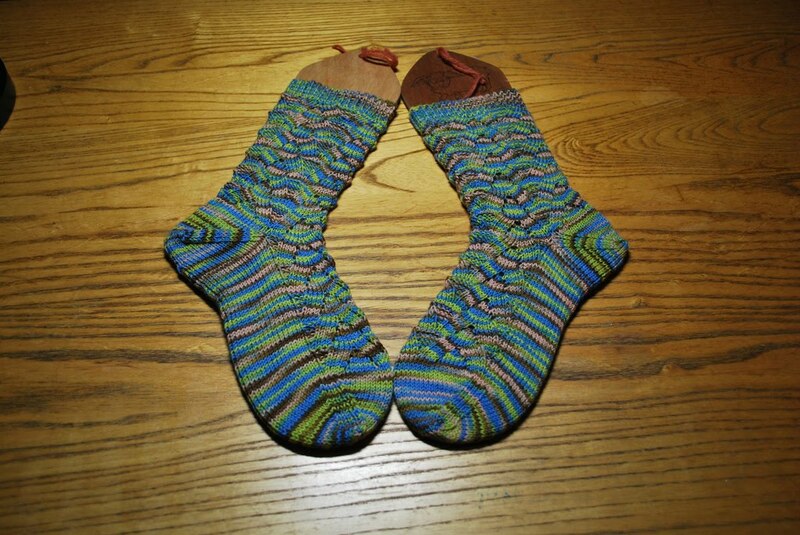 I'd certainly do that again if I had such very nicely striping yarn - it doesn't break up the colour the way a gusset would, because you don't change the number of stitches on the basic sock. March/April's pair - wow. While this wasn't a complicated knit in the end, it was a complicated start, with 10 markers on each sock and lots of travelling stitches. 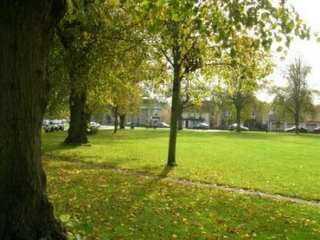 This was the first of the Diagonals section, and you can tell... These were a birthday present for my friend Sue. The yarn was some from the Socktopus sock club - Enchanted Knoll Farm in Emerald Lake. 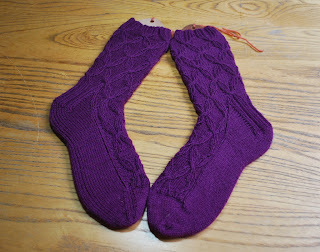 And then finally for this post, May/June's pair, Rhombus. This is definitely the most difficult pair of socks I have ever knitted. And they look so innocuous! I don't know whether it was the two types of make-one-stitch involved, or the fact I never quite managed to memorise the pattern repeat, but I've never been so stymied by a pair of conventionally-constructed socks. Speaking of which, there's a hat calling me. Talk to you tomorrow. A whole bunch of gorgeous socks - nice choice of yarns and colours too.